I promised to share some of the food pictures I took during my nephew’s visit, and I like keeping my promises. During the week that my nephew, Thomas, stayed in Saint-Chinian, we went out for a few meals. It really started on the way back from Toulouse airport. Thomas arrived at just after 5pm – too early to have dinner in Toulouse. 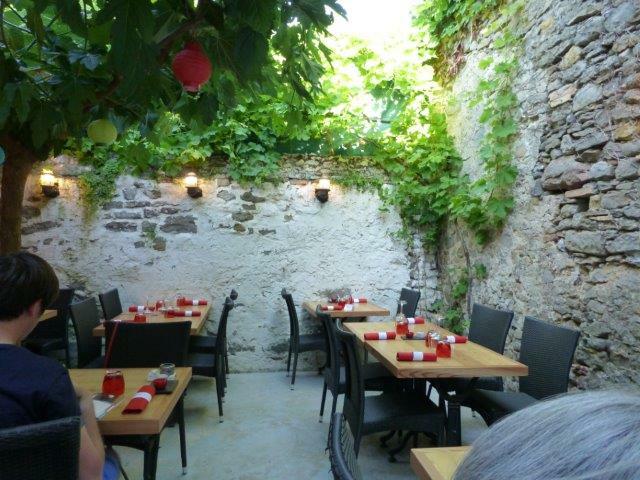 We therefore decided to head in the direction of Saint-Chinian, and along the way had the idea to re-visit a restaurant in the centre of Carcassonne called L’Escalier. When I last visited this restaurant it was specialising in Mexican food, and I was looking forward to that. However, since that last visit the theme has changed, and now Bistro food is all the rage. The ambience was still the same, somewhat ramshackle and haphazard, and at the same time very cozy. We were quite early and had our pick of the tables. Luckily I can always remember a good meal!! 🙂 Thomas had chosen mussels for his main course, just plain moules mariniere – fresh mussels are very difficult to come by where he lives. The mussels were absolutely wonderful! They were served in a large salad bowl, with another bowl the same size for the empty shells, and they were piping hot and freshly cooked. 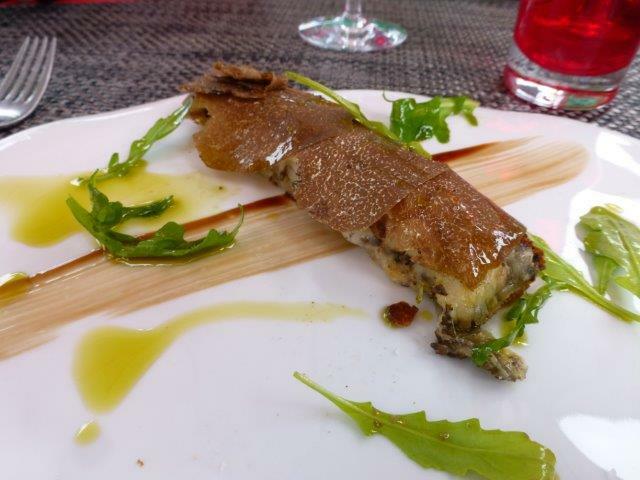 My partner had ordered a dish called pluma de porc, which is a cut not unlike the filet, but with more marbling. It was deliciously tender and the portion was very large. I had chosen the house speciality burger: a submarine roll, filled with slices of grilled duck breast, foie gras and onion marmalade – total decadence!! After all that food we skipped dessert – we had all eaten very well! Our next outing was to Pizza Tillou in St Chinian, and once more there are no pictures of the food. To me one pizza looks very much like the next, although the taste experience can be very different from one Pizzeria to another. Tillou’s pizzas have a very thin crust and I always ask for mine bien cuit (well done) – then it comes with slightly charred edges, and is very crispy! The food highlight of Thomas’s visit was dinner at Au Lavoir in Colombiers. I had taken his brother two years ago, and Thomas deserved that treat too. It was a perfect evening, warm enough to sit outside. 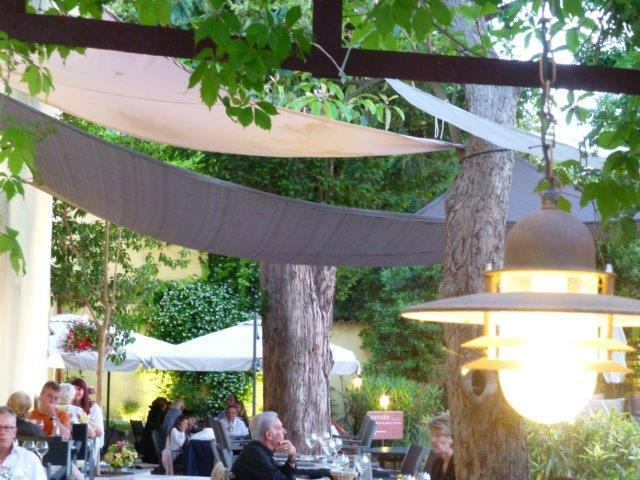 We were kindly given one of the two tables right at the end of the terrace, from which you have a view of the Canal du Midi below – such a great start to the evening!! For the main course, Thomas had chosen rack of lamb and when it came he was somewhat disappointed – he felt the portion looked rather small. He’s into eating big portions. 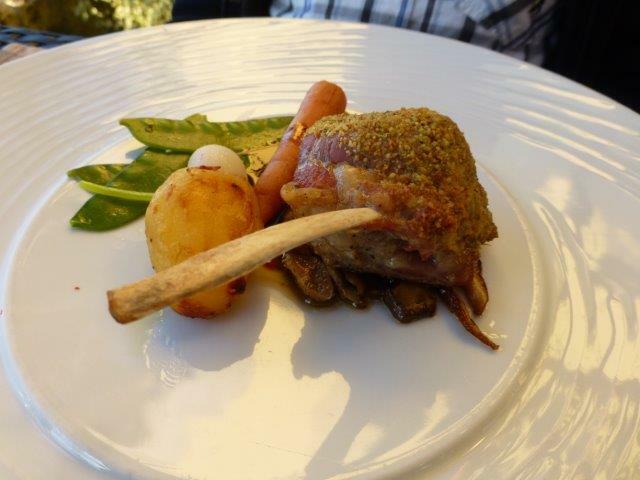 The lamb was cooked to perfection, pink and juicy, and ever so tender! 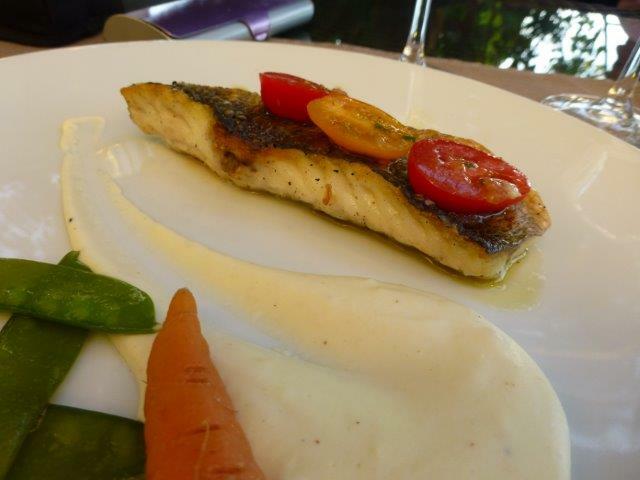 My partner had filet of sea bass with a celery cream – yummy!! 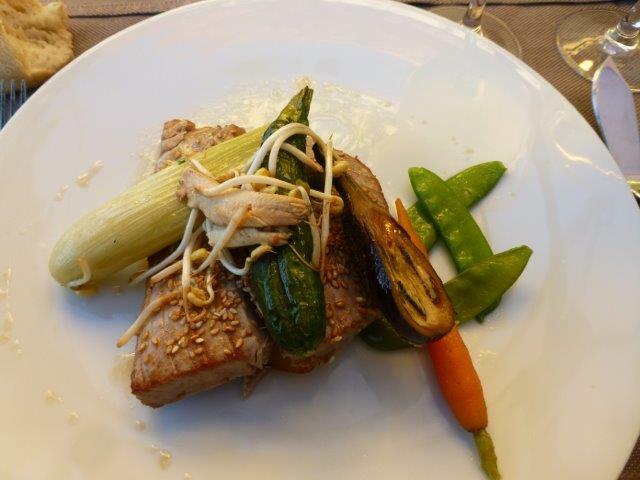 I had chosen the tuna steak for my main course – beautifully juicy and oh so tasty! 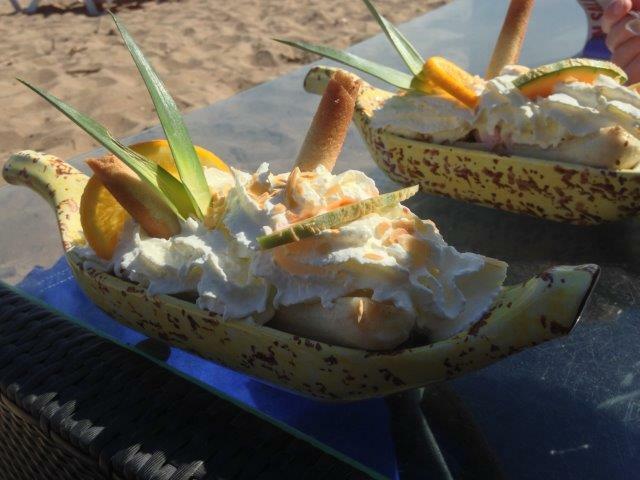 Desserts at Au Lavoir are always delicious!! Thomas wanted the moelleux au chocolat, a kind of half-baked chocolate cake with a melting centre. 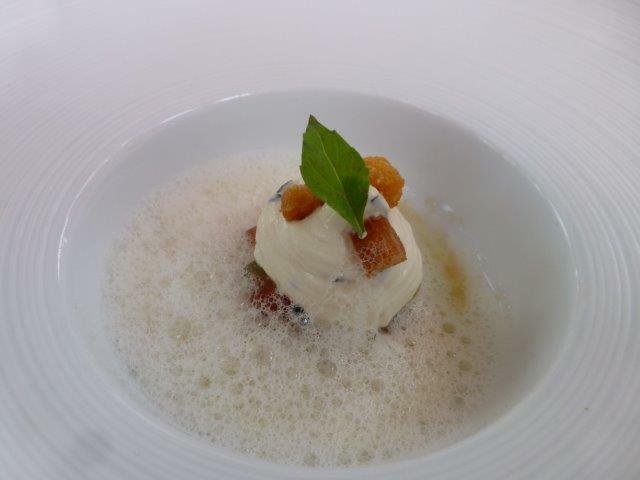 It was served with a scoop of vanilla ice cream – Thomas was in seventh heaven!! My partner opted for the crispy green banana fritters, with ice cream and a salted butter caramel sauce – I could have very happily eaten that instead of my dessert. But then I really liked my dessert too – a raspberry tiramisu, served in a little kilner jar! As it got darker the lights came on, and the terrace took on a completely different allure. 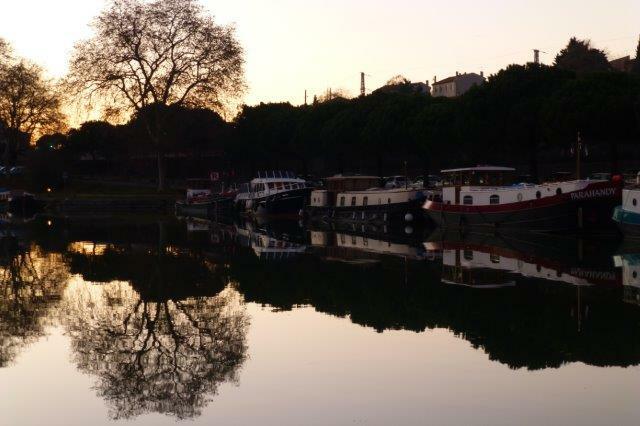 The sun set over the Canal du Midi, a wonderful end to a fantastic meal!! L’Auberge Provencale is on Allee Charles de Gaulle, a square which opens right onto the seafront. There are many restaurants surrounding this square – I don’t remember what made us choose this particular one the first time we went, but we’ve been back a good few times. We all opted for the set menu which was priced at EUR 16.90 – it had a good choice and we all found something we liked. Thomas started with a Caesar’s salad – almost a meal in itself, but then he likes big portions! 🙂 My partner enjoyed a goat’s cheese mousse, and I had a platter with a selection of starters, a bit like tapas – very delicious. For his main course, Thomas had his longed for mussels. 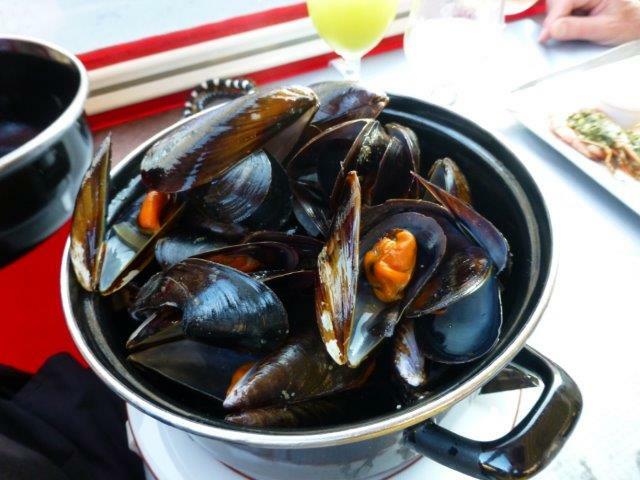 He wanted moules mariniere just as he had on the day he arrived in France – so he could compare them! He said that they were every bit as good as they had been in Carcassonne, and he did finish them all! My partner ordered a plate of grilled gambas and cuttlefish, which came with a cute basked of fries. We had previously seen these cute baskets at the Maison du Cassoulet in Castelnaudary, but weren’t allowed to have any, remember? 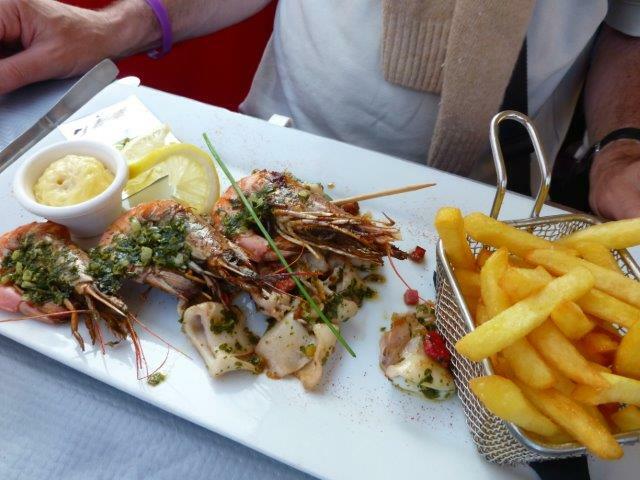 The gambas and cuttlefish were finished with a persillade, a mixture of chopped garlic and parsley. I had a hunger for mussels too – I don’t often prepare them at home. 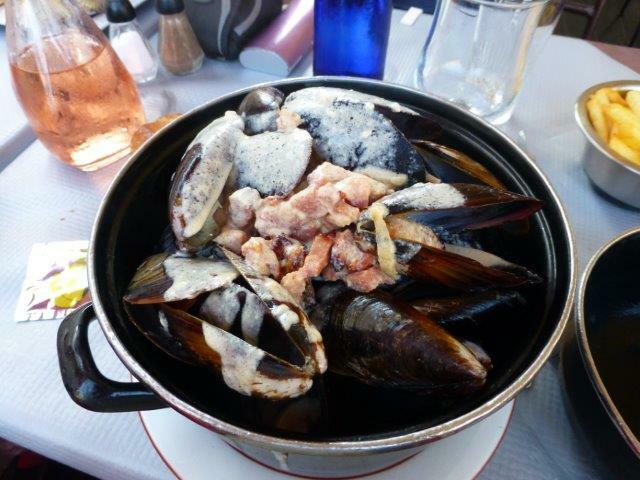 I decided to try the mussels with sauce campagnarde, which is bacon, onions and cream – a great combination, and one which went well with the mussels! Both the mussel dishes came with a bowl of fries, and they were very good too! The dessert menu was fairly standard, with the usual creme caramel, mousse au chocolat, etc… We ended up ordering ice creams. Thomas was tempted by the “Bounty” coupe, which was coconut and chocolate ice cream. My partner fancied the “authentic Italian gelato” with caramel sauce, and I ordered a strawberry sundae, which came with an almost obscene amount of whipped cream! All very good and not a spoonful left at the end of the meal. What a wonderful finale to what we hope will have been a very exciting holiday for Thomas! Summer evenings in July are often punctuated by flashes and noise – the kind made by fireworks 😉 !! Even small villages will have fireworks displays around Bastille day, on the 14th of July, and the displays range from OK to impressive to totally stunning. The town of Beziers is only 30 minutes by car from St Chinian – the fireworks there are always displayed on July 13, and set off from the bridge which takes the Canal du Midi across the Orb River. I went this year with a few friends and together we braved the drizzle, whilst waiting for night to fall completely. When the fireworks started I found that my camera battery had run out of power, and that I had left the spare battery at home – oh no 😦 ! I was lucky though! One of my friends filmed part of the fireworks, and has agreed to share the video with you! Thank you, Helena!! E-mail subscribers, please remember that you will have to visit http://www.midihideaways.wordpress.com to view the videos. I am sure you will agree with me that the fireworks are pretty spectacular! Since we were sheltering from the rain, our viewpoint was probably not the best, but still… I’ll be heading there again next year!! July 14th is the main day for fireworks all across France, and the village of Bize Minervois sends the rockets up from the footbridge across the river. I got there in plenty of time, armed with two cameras and plenty of back-up batteries!! The preparations looked impressive, with all the various boxes of fireworks set up between breeze blocks, and many wires on the floor. I found a great spot on the main bridge, and set myself up with the cameras. As it got darker, more and more spectators assembled on the bridge, and when night had finally fallen, a procession of children with lanterns (accompanied by their parents) made its way from the village across the bridge and down to the river bed. Soon everyone was settled and eagerly awaiting the action! The display started with a few loud bangs, and then the rockets followed. I had set up one camera on a tripod, and was experimenting to see if I could get some interesting shots. I’m not sure that it was very successful, I’ll let you judge for yourself. I was very lucky to catch another fireworks display this week, in Carcassonne. No loud bangs and smoke though. This display was of the culinary type, and was served at Restaurant Le Parc. It was every bit as exciting as the rockets in the sky. After we had taken our seats, we were served some bread accompanied by a phial of Picholine olive oil. The instructions were to pour the oil into one of the channels of the dish, sprinkle some of the sea salt (from Gruissan) over it and dip pieces of bread into it. At the same time there was also a small dish of Parmesan shortbread biscuits. Next appeared the “amuse bouche” a beautiful platter with three delicious morsels for each person: a meringue topped with aubergine caviar, a light-as-a-feather sponge cake with foie gras and chopped pistachio nuts, and a piece of marinated sardine on a slice of melon, topped with some flying fish caviar. Oh my – all those mouthfuls were incredibly delicious!! 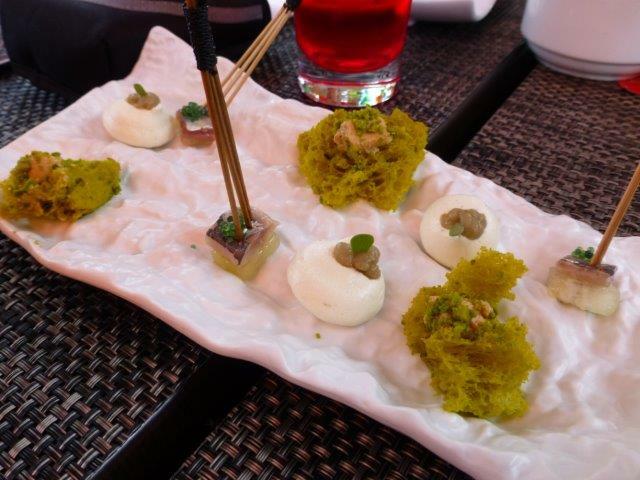 Next came a “tartar” of tomatoes – the waiter explained that they used a variety of heirloom tomatoes of different colours – topped with mascarpone and purple basil. The foam is a vodka emulsion. Next came a more substantial starter! 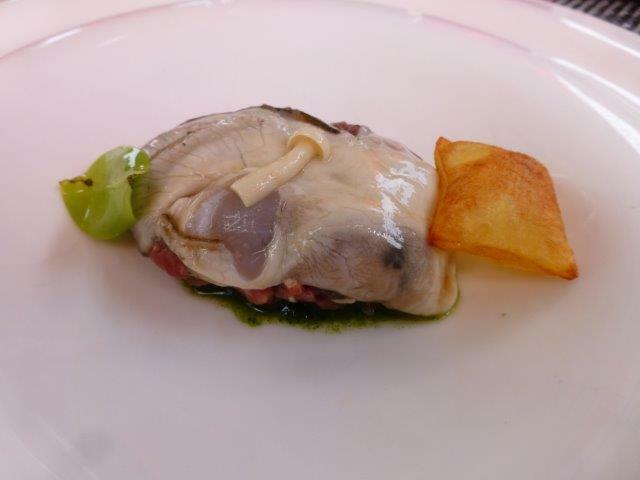 Beef tartar, topped with an oyster, and accompanied by a fried potato. The tartar sat on a green sauce, which had all of us guessing, until our waiter told us that it was watercress puree. I’m not normally a fan of raw oysters, but this was a very tasty combination! The next course was truly heavenly – a crouton topped with white beans from Castelnaudary and buffalo mozzarella, and finished off with shavings of summer truffle, the whole accompanied by some rocket leaves. The summer truffles are not as pungent as the black winter truffles but their flavour is every bit as good, and the combination with the beans and the mozzarella was inspired. Just when we thought that it couldn’t get much better, the next course arrived. A bowl of orzo risotto (orzo are small, rice-shaped pasta), topped with slices of blue lobster, which was topped with what looked like a piece of clingfilm. Not in this kind of restaurant though – it was a sheet of soya, and our waiters soon came with phials and poured over some lobster stock, seasoned with soya sauce and olive oil. The soya sheet magically shrank and clung to the lobster slices, while the risotto soaked up some of the juices. 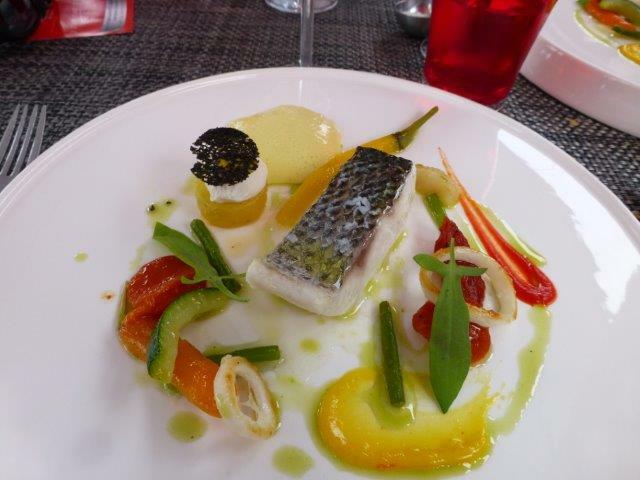 There was no letting up at this point – the next course arrived, and it was as pretty as a picture, and as tasty as anything which had come before: a perfectly cooked piece of sea bass fillet, accompanied by some beautifully prepared vegetables, and aioli. On the top left there is potato, topped with a poached egg, and that in turn is topped with a squid ink crisp – another divine mouthful! The squid rings had the most exquisite caramelised taste, and the aioli was as light as a feather. 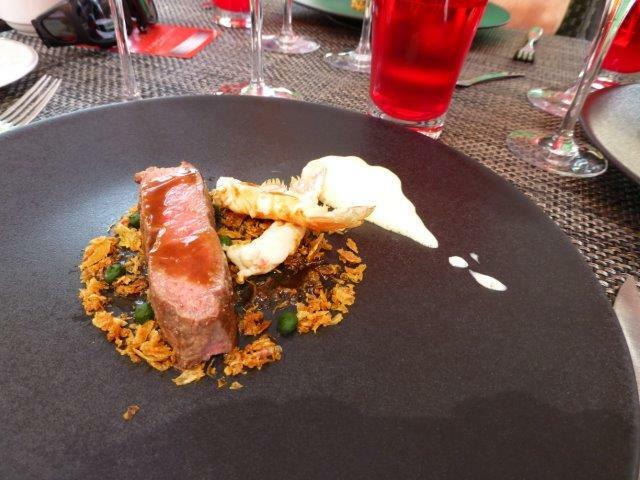 The last of the main courses appeared next – a piece of Scottish Angus chuck steak, cooked to absolute perfection!! The tender meat was accompanied by caramelised shallots, tarragon pearls, Iceland scampi, and a sauce bearnaise, which again was as light as a feather. After a short pause the cheese trolley appeared at our table. I’ve never seen a cheese trolley like this before, they must have had it custom-made!! it seemed ordinary enough when it pulled up, but then there were pull out shelves on either side, containing ever more cheeses! The selection was mind-blowing, with cheeses not only from France but also from Italy. My final cheese selection was quite modest by comparison with the overall selection, but really, who could do a cheese trolley like that any more justice, after all the wonderful food which had come before? 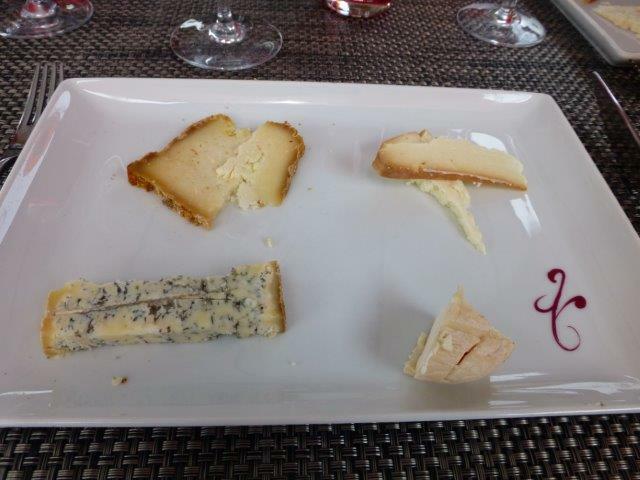 I had Bleu de Gex, Bethmale, smoked Pecorino, and a goat’s cheese. 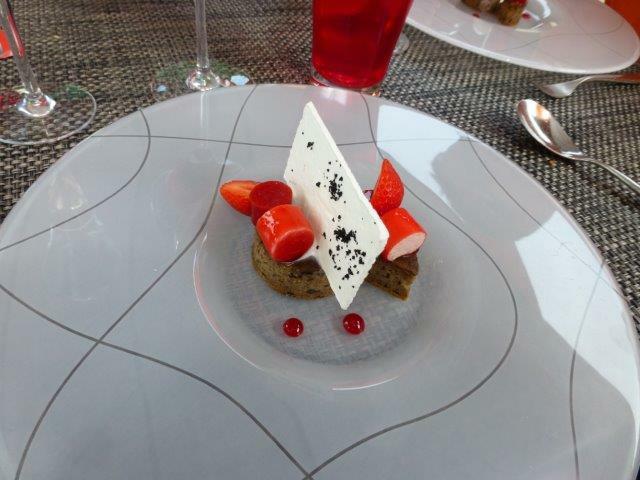 Next we started with dessert – a beautiful refreshing creation, which was all about strawberries. On a base of poppy seed and olive cake were strawberry mousse and strawberry jelly, lemon verbena sorbet, and a sheet of meringue with black olives. The strawberry flavour was pure, concentrated, and simply divine. When I expected it to be over, the waiters re-laid the table with yet more cutlery, for a second dessert 🙂 !! 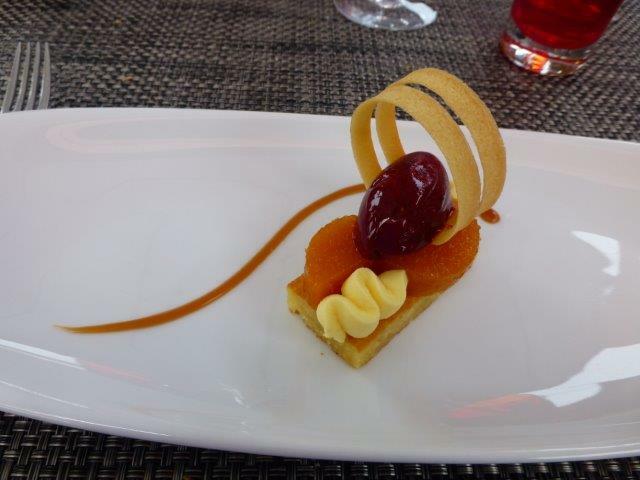 This was as visual as it was tasty: on a base of orange cake were apricot puree and orange mousse, topped with blackcurrant sorbet, and the lightest and crispiest of biscuits. The decoration on the plate was caramel, which went wonderfully with the rest! 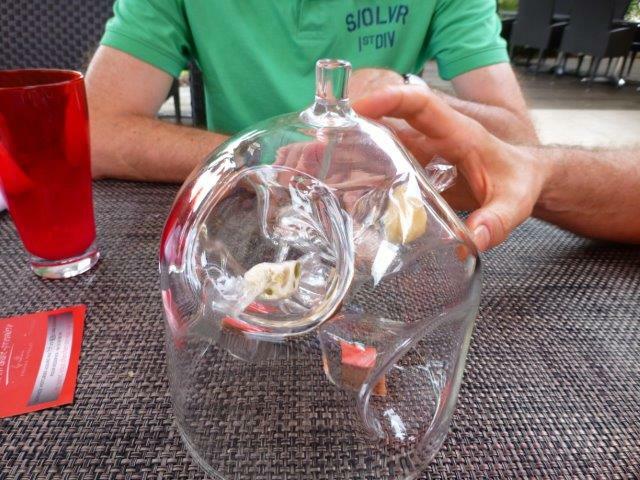 With coffee came an amazing glass contraption, shaped like a bee hive, with niches containing various sweets – more delicious morsels…. So there you have it – definitely a virtuoso display by a very talented chef! This week I want to share a very special experience with you – one that you may not be able to replicate exactly the way I experienced it. Some of you may remember my post about Carcassonne, a little while back. 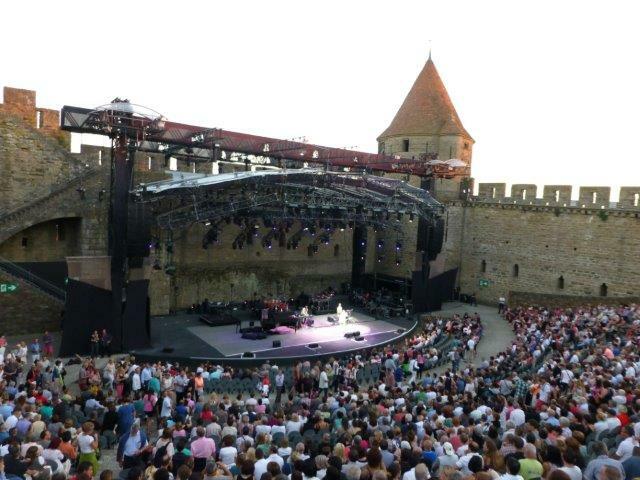 Every summer, Carcassonne hosts a festival during the month of July, presenting music of all types, theatre, and dance all over the old and new towns, in a mixture of venues. There’s jazz, pop, rock, opera, soul – you name it, it’s all there. Some of the concert highlights this year included Status Quo, Lana del Rey, Pink Martini, Franz Ferdinand, James Blunt, Vanessa Paradis, and Elton John. You can find the full programme here. If you’re into your music you might be getting somewhat excited by now – I think it’s a pretty amazing line-up for a town like Carcassonne. And that’s just this year! They have international musicians every year! To get back to my story, I found myself in Carcassonne on July 15, the day after the spectacular fireworks extravaganza which takes place in Carcassonne every year (I will visit that for you another year, promise!!). 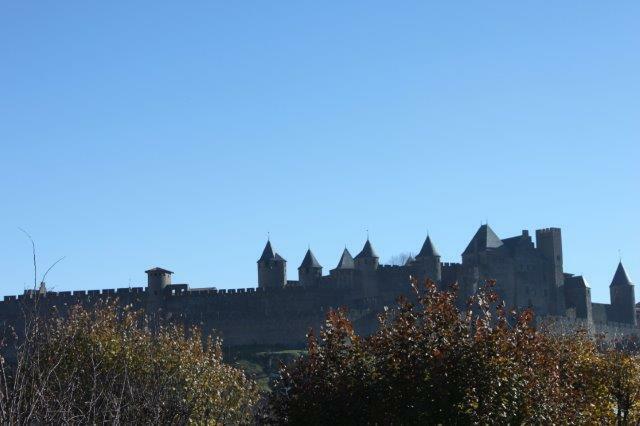 Carcassonne is always lovely to visit, there’s always something going on and the towers are lovely to look at. I had arranged to meet friends for dinner before the concert, and I was early, so I had a little time to walk about. 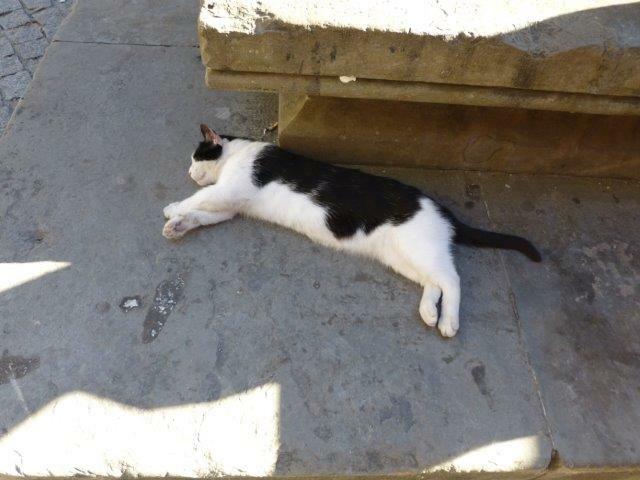 The streets were busy with tourists, but despite the bustle this cat had a lovely time, stretched out in the shade 🙂 !! There’s always colour and quirkiness to be found in Carcassonne! The restaurants on Place Marcou were already busy. Just the other side of Place Marcou I met up with my friends, and since we were too early for our restaurant, we had a drink in a neighbouring bar. Dinner was booked at La Table d’Alais, a little restaurant tucked away in a row of houses on Rue du Plo. We walked right past it to begin with, without realising that it was there. The street entrance is just a small doorway, with the dining room and terrace all located on the first floor. 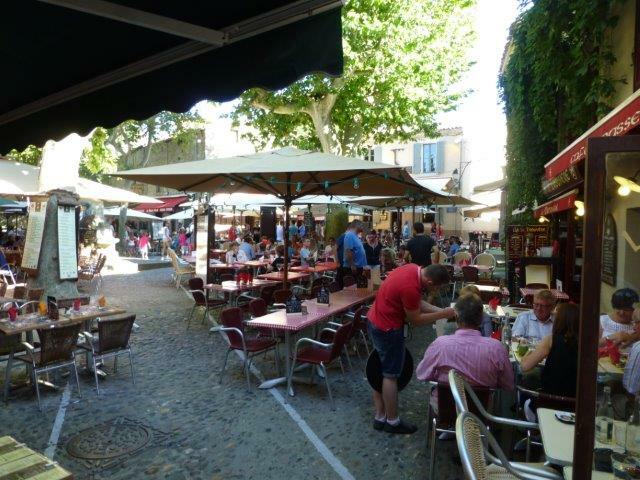 It’s not easy picking a restaurant in Carcassonne – there are scores to choose from, and reviews on the internet can be variable and not always reliable. We were very pleased with our choice though; the food was delicious and the prices pretty reasonable for a town like Carcassonne. The starters were beetroot salad with goat’s cheese mousse, foie gras, and gazpacho. Can you guess who had the foie gras?? For main course there was tuna belly with courgette puree, pork fillet with mushrooms, and cassoulet. Can you guess who had the cassoulet?? I admit, I pigged out a little, but both my dishes were very good!! After we had finished our main courses, everyone got a little anxious as the time for our concert drew nearer. We did get our desserts and in the rush I forgot to photograph it. It was a tarte tatin made with golden delicious apples – well enough executed, but slightly uninspired. 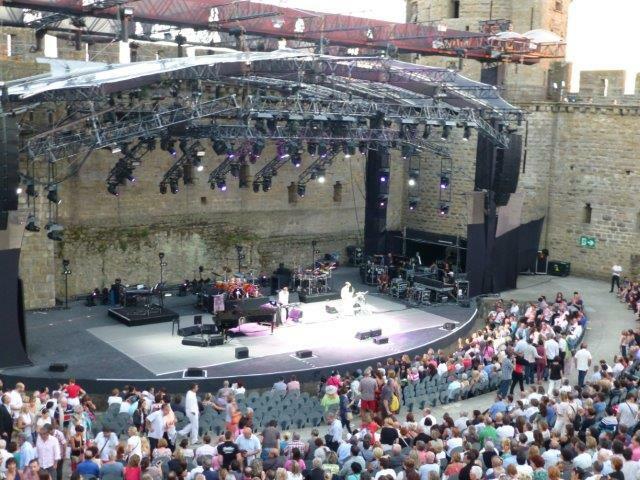 The concert was in the open air Theatre Jean Deschamps in the Cite. This theatre was created in 1908 on the site of the old Saint Nazaire cloisters, and named in 2006 after the French actor Jean Deschamps, who created the Carcassonne Festival in 1957. Above is a view from our seats down to the stage. The orchestra stalls in front of the stage are called the Carre d’Or, the golden square. What a nice name!! The first tier in front of us is called 1ere Serie, and we were in the second tier, predictably called 2eme Serie. Now here’s a tip if you want to go to the festival. Our seats were Rang B in the second tier, numbered 77 to 81 – the view was spectacular and because it was the first row of the second tier there was nobody sitting in front of us! As we were taking our seats the warm-up act was just about finishing – I’m glad it didn’t last long :). We had come to see Elton John, and his concert started on the dot at 9:30pm! There then followed one and a half hours of music and pure magic! 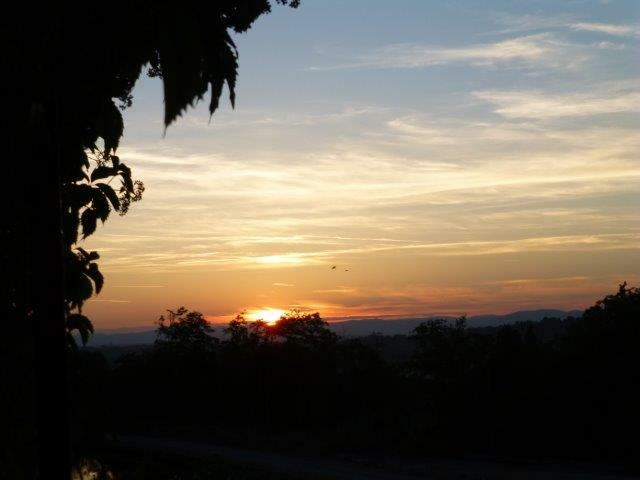 As the evening wore on, the sun was slowly setting behind the crenelated walls, and the atmosphere gradually changed. It was magical! Very early on in the concert, Elton made an announcement to say that, after the current round of concerts and touring, he would be retiring from the music business, to spend more time with his children. I think it made the evening even more special for everyone. 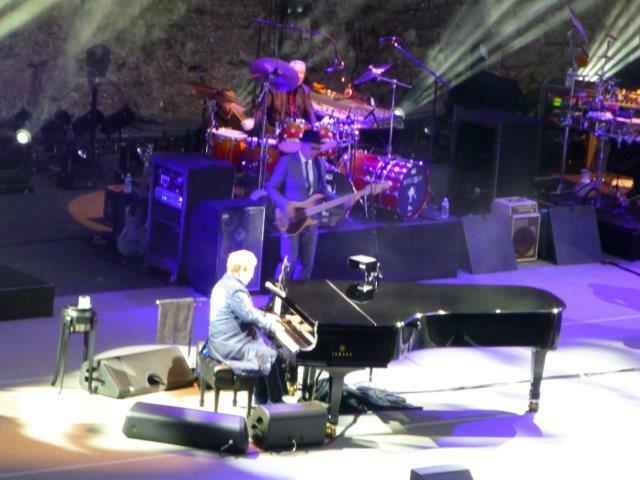 Elton played song after song, without a break or long chatty bits, and his music still sounded fresh. At the end of the concert he played a couple of encores, but we made a dash for it after the first one, trying to hit the road before the rest of the 5000 spectators did so. And we were successful, and back in St Chinian just after 1am, tired but very happy!! I’ll leave you with a few shaky videos of the evening – the piano playing especially was very good! E-mail subscribers, please visit http://www.midihideaways.wordpress.com to watch the videos. We’ve been having some beautiful sunny weather and gorgeous blue skies, and it’s been difficult to get into the Christmas spirit. 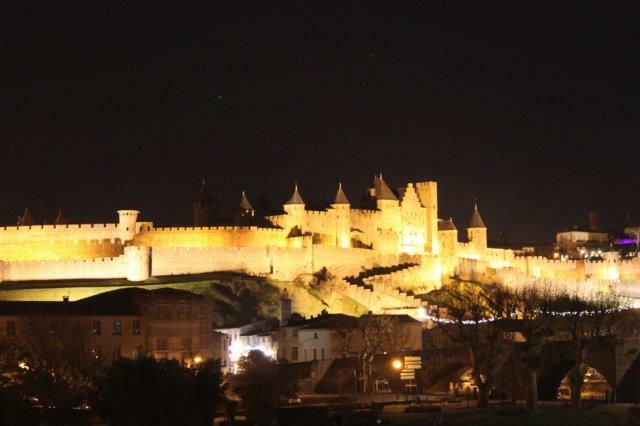 I thought I could remedy that with a visit to the Fete de la Saint-Nicolas” Carcassonne, and what a good idea that was. 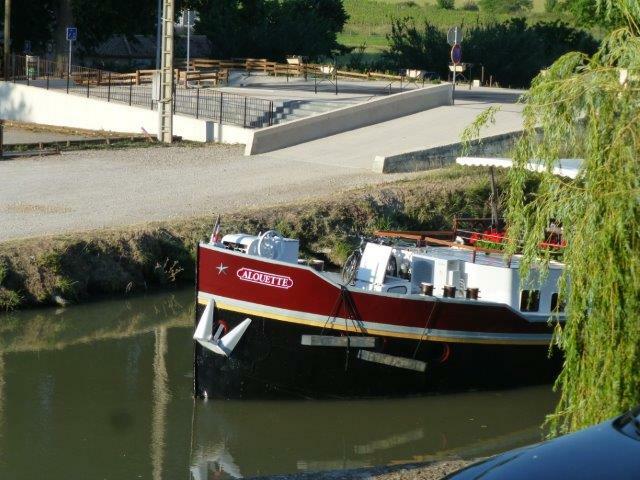 On the way I passed through Trebes, where the Canal du Midi runs beside the road for a short while. Take a good look at the picture. It’s not often that you’ll be able to see the Canal du Midi without water, and it won’t be all that long before it will be filled again. The canal closes to navigation at the end of October, for two months of maintenance works. During that time some sections of the canal get drained of water, to allow work on lock gates and such to be carried out. On to Carcassonne though! I found a great parking spot near the railway station and walked right across the lower town and up the hill to the Castle – strictly speaking it’s a fortified town with a castle inside it. It is not as far to walk as you think and it’s a very pleasant stroll down the pedestrian Rue G. Clemenceau, turning left into Rue de Verdun, past the Dome and across the Pont Vieux. The Dome is a curious building, and I’ve not been able to find out just what it was for, but my theory is that it might have been the building at the centre of a covered market like the one at Revel, not all that far away. From the Pont Vieux the views of the Castle are spectacular! (If you are around for the fireworks on July 14 it’s a good viewpoint, but it will be very crowded!) On the bridge a young man sat playing his accordion, seemingly only for himself, not for an audience. 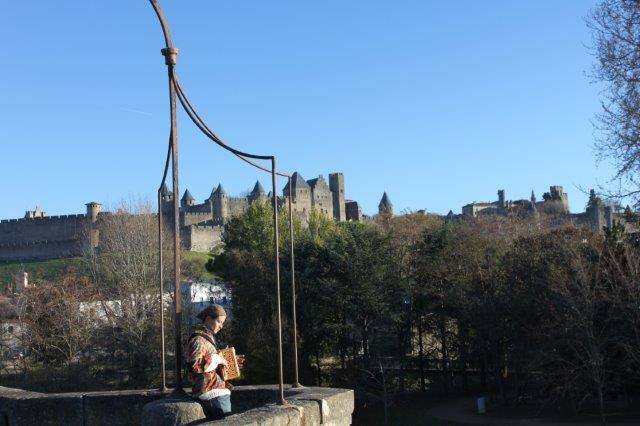 It was lovely to sit in the sunshine, watch the world go by and listen to the music. 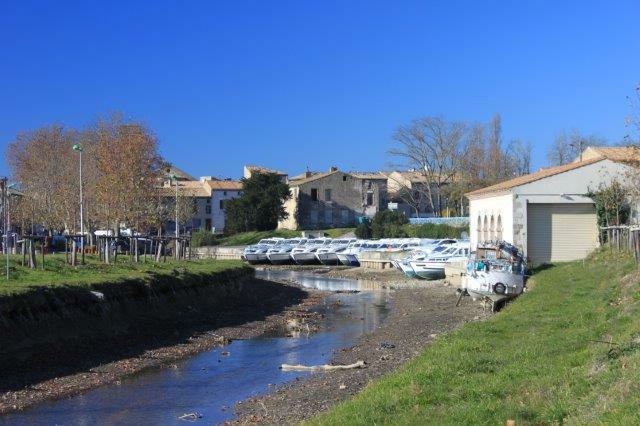 Once across the Pont Vieux you enter the Trivalle neighbourhood, which has a lovely feel to it. There are many old buildings which have been beautifully restored, and others which have a completely original and unrestored feel to them. To get to the castle there are two different paths: you can either walk to the Porte d’Aude on the western side or to the Porte Narbonnaise on the eastern side. 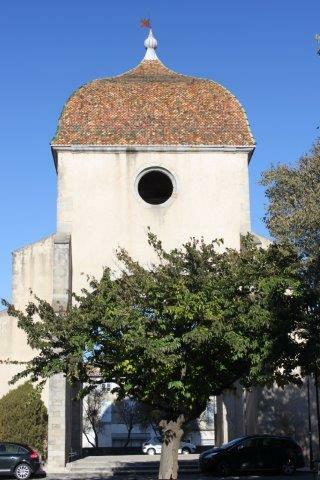 I chose to go to the Porte Narbonnaise as the climb is not as steep; however it’s the principal entrance and might be the busier of the two when you visit. When I got there the Castle was not as crowded as it usually is during the summer months, but I was there not long after lunchtime, and perhaps everyone was still eating? I was looking for the arts and crafts market, held on the occasion of the Fete de la Saint-Nicolas, from December 6 (Saint Nicholas Day) to December 8 this year. There was a lovely selection of items and the backdrop was of course wonderful. The market was held right next door to the open-air theatre where all kinds of concerts are performed in the summer. After a stroll around the rest of the castle, and a snack, I was off again, down the hill and across the bridge, to explore the main Christmas market in Carcassonne, which is held on Square Gambetta. From the castle I had already seen the big ferris wheel, and there was a lot more when I got there! The children’s interests were well provided for with several rides: reindeer for the little ones, a Disney themed magic sleigh ride, and the beautiful carousel which is normally outside the castle, in addition to the big ferris wheel. The stalls around the square sold a variety of goods, with food and mulled wine being at the fore! I couldn’t resist the sweet pretzels, which were really doughnuts in a different disguise. With a glass of mulled wine they were heavenly! And they got eaten so quickly that the thought of a photograph never even entered my mind :-)! Not far away in Place Carnot a skating rink had been erected, taking up pretty much the whole square. On the way back to the station there was yet one more stop – by the Andre Chenier car park the sledge runs had been set up! An enormous structure, clad in white fabric, with runs on either side. One side allows the children to race down on small toboggans, the other side is for children and adults and you race down on large inner tubes – what fun!! Around the sledge runs there were more fair ground rides, a fairly tame reindeer rollercoaster and some lovely “ride-your-own-reindeer” bicycles for the smaller children! Across the Canal du Midi once more to get to the car, and a quick snap of a lovely scene in the port. And then it got dark, and the whole magic of Christmas came to life!! I don’t think anyone can say “bah humbug” to all that! A final note: the market and rides on Square Gambetta and the sledge runs by the Andre Chenier car park are open until January 5, 2014; the skating rink on Place Carnot is open until December 20, 2013.